Following the gathering of the Beornings around The Old Ford for the burial ceremonies of the brothers of battle, Merovech and Odo, Theodvech younger brother to Merovech asked for Beorn's blessing to travel south along the Anduin with the company, in search of answers to this riddle of death. And so it was that the four came upon a dead orc, newly slain in a ravine south of the Ford, and then a farmstead where they heard tell of a young man who had passed through only days prior, heading south towards the village of Stonyford. Finding now the southbound road along the great river, the company crossed paths with a small band of Woodmen warriors traveling to Mountain Hall, led by Eberulf the Bird-keeper, a gentle man who told the company of how they had passed through Stonyford and heard there tales of bloody murder. How a Beorning by the name of Oderic had murdered another hunter, and older man named Rathfic. According to the tale, Rathfic had caught Oderic in bed with his wife, the two had fought, and Rathfic had been mortally wounded. Arriving late in the day, the company was met outside the village border by three village elders, Hartwulf, an old greybeard who leans heavily upon his staff and mumbles when he talks. Ava, his daughter and the clan's diplomat and spokeswoman. And Wiliferd, now the most experienced warrior in Stonyford. The company, with their nearly legendary lack of bartering skills and tendency to keep the truth hidden was nearly turned away, but nevertheless managed to gain entrance into the village. Being not particularly used to travelers, the company was put up in Oderic's old house, near the river. Two of the companions spent the night in the company of the Stonyford villagers, many of whom had come out to see the queer travelers. There the companions learned more of the story behind the rumored murder, and Oderic the young, contesting as the accounts where. Oderic’s family were killed by outlaws when he was a young child. He’s been strange since then. He never stopped practising fighting since that day. Oderic was fostered by an old warrior called Helmgut, father of Brunhild. Helmgut treated Oderic like his son. Helmgut never liked Oderic; he only took him in to honour Oderic’s dead father. 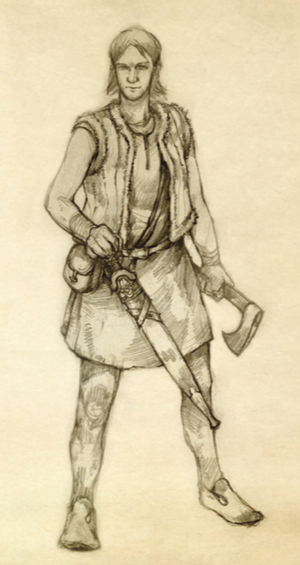 Helmgut was the best warrior in the village, and he was training Oderic to follow in his footsteps. When Rathfic came to live here, Oderic was jealous. Oderic and Brunhild lived like sister and brother. Oderic was very close to Brunhild. Oderic was obsessed with Brunhild, and would follow her around the village. He would do anything to protect her. If he came back to the village, she would know about it. A few years ago, Rathfic came down from the mountains to settle here. He became the village’s chief warrior, and was betrothed to Brunhild. Rathfic bought Brunhild from her father. Helmgut was pleased to have Rathfic as a son-in-law. Rathfic was a great warrior, and an honourable man. Rathfic was a great warrior, but he was often cruel. He cared only about himself, and treated his wife like a servant. Oderic always hated Rathfic because he took Oderic’s place in Helmgut’s heart. Oderic always hated Rathfic because he married Brunhild. One night, Oderic and Rathfic fought, and Oderic killed Rathfic. Oderic crept into Rathfic’s house and murdered him while he slept. Rathfic caught Oderic in bed with Brunhild. Rathfic caught Oderic spying on him. Oderic broke into Rathfic’s house and challenged him to a fight. After killing Rathfic, Oderic surrendered to his foster-father Helmgut, and Helmgut sent Oderic to the Carrock. Oderic would have fought his way out, but he couldn’t bring himself to kill his foster-father. Oderic would have fought his way out, but Brunhild begged him to stop. The fighting-madness left Oderic, and he realised what he had done. 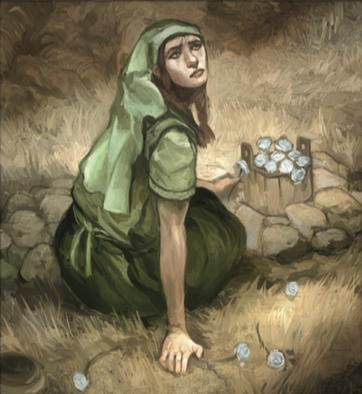 The next morning, the companions found Brunhild in the cemetery, laying flowers on Rathfic's grave. Confronting her about when she last saw Oderic, she told them that he had visited her a few days ago. That he had explained how orcs had slain Merovech and Odo, but that he had managed to slip away in the confusion. He believed that fate had given him a second chance, and that he now intended to never return to the land of the Beornings. He went west, across The Great River. She didn't expect to see him ever again. The company finds a ferryman, and verifies that he had lost one of his boats just a few days earlier, and convinces him to carry them downstream in search of Oderic's trail. A few miles down the western shore, they find the missing boat, empty and abandoned. Not long after an old campsite, and a broken knife blade of Beorning make. And finally at the edge of a forest just north of the Gladden Fields, signs of struggle. Trampled grass, splinters hewn from a shield and a broken spear-shaft. Upon closer inspection, the forest itself yielded signs of a number of men nearby. Tracks in the mud, trees hacked down for firewood and no game for miles around. Haggol the dwarf sent his raven Rok scouting under the eaves, and he returned somewhat exhausted from having fended off the large gorecrows inhabiting the region, a with news of a large camp of men in the forest. The company snuck closer under the cover of night, and spied the camp with their own eyes. Upwards a hundred armed men, disheveled and cruel. Lawless souls who have been easily seducted. They were thieves, marauders and slavers, with no common cause save wickedness and greed. Some were exiles cast aware from the Horse-lords to the South, some are from the east, some from Woodland tribes, and still others call no place home save the open road. There they saw Oderic sitting in conversation at a fire with an older man, who was cradling a jewel-encrusted sword. Surrounded by cronies and aides, the old man kept Oderic well-fed and content. This was their leader, Valter the Bloody, and he had brought those men there in search of treasure and conquest, although he was no mere bandit. As Oderic left the confines of the camp, the company quietly overtook a small patrol, and then dispatched his bodyguard, Faron the Trapper in surprisingly short order, before confronting Oderic. Faron the Trapper. Formerly alive. The company attempted to reason with the youth, but to no avail, and a fight erupted; one that left Oderic unconscious. Carrying the unconscious kinslayer, the company now hurried away from the forest camp, down towards the Anduin. Haggol sending Rok north to The Old Ford and Beorn's House to alert the Beornings of this enemy force on their doorstep. In the early morning, on the bank of the river, the company spotted a faint light on the other side, on a long island, Hag's Island as it were, in the midst of the stream. They quickly struck a deal with the man on the other side to ferry them across post-haste. Unable to carry the entire company, the companions now found themselves split, and just then a cadre of riders emerged from the forest searching for them. North rode now the company, Oderic Kinslayer in their custody. North rode the company, to the Carrock, and Beorn's justice. And now the shadow moved as well, and north rode Valter's host, to The Old Ford. In the early hours of the 12th of August, in the Wedmath of the Shire folk, a horn bellowed out across the waters of The Old Ford, heralding the coming of Valter the Bloody and his host. Awoken from their mead-induced slumber, the companions, who had been entertaining into the night the day before, now found themselves in a desperate situation, vastly outnumbered as they were. Bravery nevertheless overtook them, and leading the charge, they set and example for the Beornings to follow as the two forces met metal against metal, and arrow for arrow in the waters of the Anduin. Fierce was the battle and much blood was spilled. Valter enraged killed from atop his horse, until an arrow from the bow of Agmund son of Arnulf found its mark. Finding it easier to lead from the rear, Valter turned his horse about. In that same moment, another horn bellowed out; a proud, high note. And the eastern bank filled with armed Beornings. And at the head of them, and mighty bear! Tearing through the water, the bear overcame the fleeing Valter, and tore his head from his body in a swift movement, routing the army. Many Beornings fell in the river that day; families broken and a community on its knees. Yet the free peoples remain, and will rebuild. Even as the mountains stir and a darkness seems to spread once again over Wilderland.